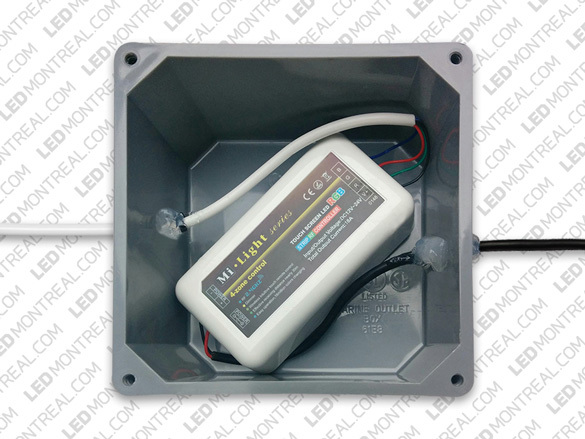 Complete your outdoor waterproofing process with the Weatherproof Project Box from LED Montreal. This PVC box will hide and protect your LED Controller from the wrath of Mother Nature. The top comes with a waterproof sealing band and can be closed easily by using the 4 included screws. You can now place your controller closer to your LED strip and still keep it well protected, and it allows you to use a longer extension between your power supply and your controller (using 14 or 16 gauge wire, depending on the length). It works wonders when your outdoor power supply doesn’t have an included protection box to put your controller in. Drill a hole on both sides of the box and insert your wires in. Then, seal the holes and wires with silicone and you’re good to go!